Need somewhere to stash your array of stuff? 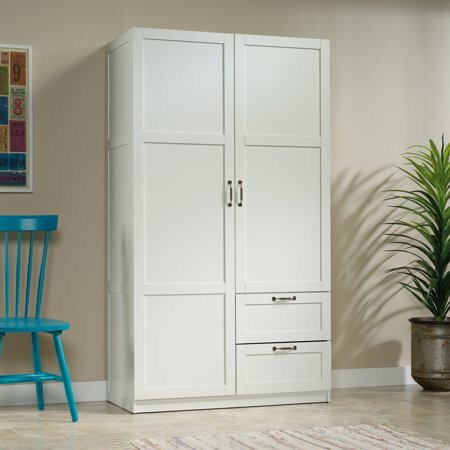 This practical and good looking storage cabinet from the Sauder Select collection is just for you. It features a garment rod and a fixed shelf behind its full length door, one fixed and one adjustable shelf behind the upper door, and two easy-to-access sliding drawers. Finished in a sleek White and detailed with frame and panel doors and sides, this cabinet is the perfect storage solution for your home. Very pretty! Easy to follow directions. I love how all the parts were clearly marked even the hardware. It does take awhile to put together and you need a lot of floor space but well worth it. It has plenty of space for all my things. I'm very happy with it. A few of the pieces were damaged in shipping but was easily replaced and received promptly. I enjoyed the fun of putting it together with my husband. It looks nice in our room. The armoire was assembled in one evening. All parts and hardware were received. The armoire looks great in our laundry room. It has plenty of storage space including the shelves and drawers and the vertical storage area on the left. Very pleased with it! It also has rollers on the bottom which made moving it quite easy. Will recommend this item for a nice looking and reasonably priced unit. Also, we received the shipment ahead of schedule which was a pleasant surprise! It was well packaged and all parts were in excellent condition. This cabinet is pretty spacious and I like that it has drawers, shelves and hanging space. I LOVED the instruction manual. I would give the manual 5 stars! Whoever wrote that was humorous and wrote very clear steps to follow. I'm very happy with this piece of furniture. It looks nice and meets my storage needs. Poor quality. The closet has scratches on the doors. We bought this wardrobe to replace an armoire from Sauder's that we have had for 15 years and we loved it. It was made with great quality. This new wardrobe is made with they "flimsy" doors and not even close to the sturdiness and quality wood of the previous one. Will not buy again. Saunder brags about being an American company since the 1930's so why isnt this produced here with quality material. 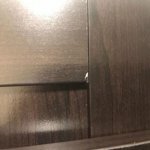 its obvious it is imported by the materials and instruction that are incorrect in some areas and if I had not any knowledge of carpentry i would have put it together incorrectly and not had any idea of what I did wrong!! It's made of cheap particle board that for the price should have been plywood and not done well, there should have been a support in the back bottom to keep the bottom of it from sagging like the front has, it's just another cheap disposable piece of "furniture" by saunder. It was broken on the main pieces. There is no repair and to boot when I try to start a return on the website it tells me that it is having technical difficulty and it redirects me. I would not purchase something like this again through Walmart's website.